Look for the Proudly Wisconsin Badge when shopping for cheese. Any brand of Wisconsin Butterkase or Fontina can be used in this recipe. Place the parsley, cilantro, oregano, garlic, red pepper flakes and salt in a food processor; cover and pulse until finely chopped. While processing, slowly drizzle in olive oil and red wine vinegar; cover and process until smooth. Set aside. Mash the avocado, cilantro, lime juice and salt in a bowl until desired consistency. Gently toss lobster with 2 tablespoons reserved chimichurri sauce in a bowl. Spread 1 tablespoon chimichurri sauce on each bread slice. 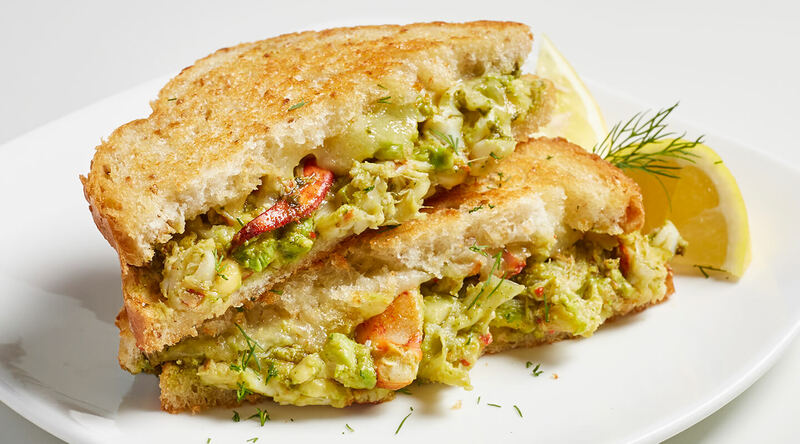 Layer two bread slices with butterkäse, lobster mixture, guacamole and fontina. Top with remaining bread slices, chimichurri side down. Spread outsides of sandwiches with butter, lightly pressing together. Cover and refrigerate remaining any chimichurri; save for a different recipe. Toast sandwiches on a griddle over medium-low heat for 2-4 minutes on each side or until bread is golden brown and cheeses are melted. Covering the sandwiches while browning the first side helps the cheeses to melt. Cook uncovered while browning the second side. Butterkäse originated in Germany; its name literally means “butter cheese.” Although, it contains no butter, it has a butter-like texture and delicate flavor.